One of the greatest things about this blog is when I get feedback from you, the reader. 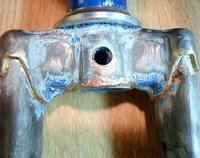 I received an email from Jose today about his current project inspired by this bike repair blog. Jose is serving with his nations Armed Forces and he is stationned overseas. Yet, he has managed to find a road bike carcass and decided to turn it into a single speed fixed gear bike. The great thing about bikes, is that their parts are interchangeable from one bike to another. One example is the bottom bracket where the pedal axle resides. In this case, Jose's bike has an English threaded bottom bracket, this setup has not changed in over a hundred years. The only thing he has to worry about is the width of the axle. He will be able to fit a modern sealed bottom bracket on that thing in a snap. Road bikes are plentiful and cheap. 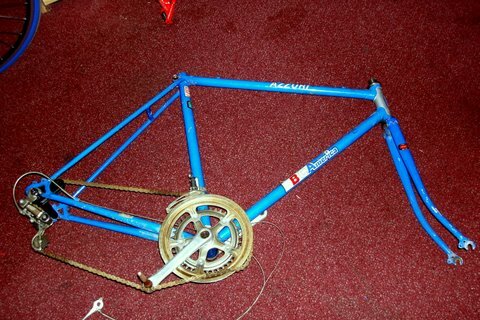 You can locate one in decent shape and rebuilt it as a road racer, touring bike or, like in this case, a fixed gear bike. One strategy that I encourage when doing projects like these is to start with what you have and buy the least parts to get you rolling. This way, you'll find out if the ride is suitable for you without spending too much cash. If the ride is good, buy your upgrades as you can afford them. If it doesn't work out, you won't have spent a whole lot to find out. But don't throw that bike away, keep it for those parts!